Notice the spooky shadow across the plate? No, it’s not my phone casting a shadow, it’s a SPOOKY shadow, got it?! 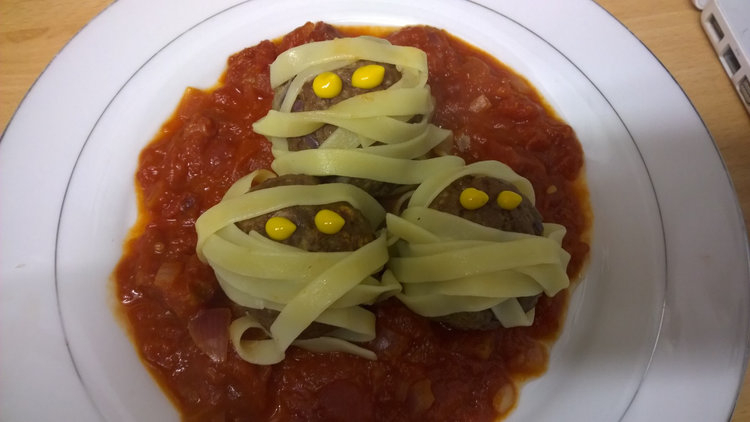 I found this fun halloween meal idea in the Tesco magazine. You could of course just take the idea and use your usual meatball sauce, but I decided to follow the recipe they provide – I figured it might be geared towards helping the pasta to stick to the meatballs, with a drier surface to them. This is a much quicker cook than a usual meatball sauce and so the meatballs, which are cooked separately from the sauce, are more like burgers, but that’s ok, it makes a fun change! – Yellow American mustard for the eyes. 1. Make the sauce by cooking the onions in the oil over a low heat for about 5 minutes until softened, add the garlic and cook for a couple of minutes more. Add the tomatoes, along with the sugar, salt and pepper and leave to simmer gently while you make the meatballs (add a little extra water if the sauce cooks down too much). 2. Put the breadcrumbs in a bowl with the milk, stir in the parsley, garlic and salt and pepper and leave to soak for 10 minutes. Using your hands, combine the ground pork and beef, and the onion, into the breadcrumb mixture until well combined and then shape into 12 meatballs. 3. Place the olive oil into an ovenproof dish and sit the meatballs in there, they should fit snugly. Bake in a preheated oven 180C/350F for 15-20 minutes until firm and cooked through. 4. While the meatballs are cooking, cook the tagliatelle according to instructions on the pack. Drain them and run a little cold water over to make them cool enough to handle. 5. Wrap strands of the tagliatelle bandages around the meatballs and place on a bed of the tomato sauce – I’ll warn you this is quite fiddly (and by “quite fiddly” I mean: big pain in the backside that had me wishing I’d never started, but decided to carry on because I wanted to post it on this blog!). In the end I found it easiest to take three strands, wrap them around the centre of the meatball, then make a gap after placing them on the sauce. If it takes you as long as it did me, you might want to give it all a quick zap in the microwave to reheat once assembled. Then use the mustard to make eyes. Stop by here tomorrow for a spooktacular halloween dessert, assuming all goes well when I make it of course….muahahaaaa!!!!! I’m with you there! I’m always a bit funny about eating things that come from kitchens where I don’t know what hygiene standards they work to! Even in restaurants I find myself wondering if they’ve washed their hands before preparing food – I try and stop those thoughts, but they still creep in! Also, you know when you see the TV chefs who are cooking and have sweat dripping off their brow, and you wonder if maybe they’re leaning over your food while they’re preparing it and…ugh! Stop this Vanessa! Really cute idea! I’ll share this on Facebook. I think it would be much harder too if the meatballs had been cooked in the sauce and were all slidey!